If I listed my companies Core Values in order of importance, this one would be number one. What does Integrity mean? It means sticking to your personal and business code of conduct. It means doing the right things, even if they might cost you business. When we live with integrity, we’re more likely to succeed. With our integrity intact, life is less stressful and far less complicated. The old adage that the truth-teller doesn’t have to remember the stories they tell because they are relaying the truth is applicable here — when you tell the truth, you can look in the mirror or another person’s eyes and you’ll have nothing to hide. It’s simple. Being known as a respectable, ethical, and integrity-driven person holds weight. Having the highest ethical standards both at work and at home means we will never compromise our values. We do what we say we are going to do, and we never make a promise we cannot (or don’t intend to) keep. If there’s one thing Star Staffing is, it’s a leader in the staffing industry. We’re leaders in top talent. We’re leaders in service, and in ethical and honest business practices. We didn’t become these things by accident; we’ve earned this reputation through demonstrating high ethical standards and practices executed by our dedicated employees. 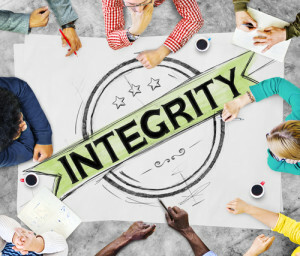 Integrity is one of the key features of both successful individuals and businesses. As Mark Goulston, writing for Fast Company, notes, creating the “greatest-value service or product” creates integrity of vision. This passes on to employees, who are that much more motivated to bolster that integrity. Cut costs where you can, but not at the expense of your output’s quality. Ensuring integrity in your operations is a ground-up affair, not a top-down one. If each employee works with integrity and respect, and each department follows suit, keeping operational costs in mind, and leadership provides the highest level of integrity as well as guidance for the business, high integrity and respect in your field is bound to follow. Maintaining our stellar reputation is crucial for our future as the leading premier staffing firm, and a leader on the list of Best Places to Work. We maintain this reputation by fostering respect in the workplace and bringing deep, cultivated integrity to the table. Do You Have the Top Four Traits That Predict Job Success?